It's important to highlight your merchandise it the best way possible. Give customers a full view of the items they want to purchase! 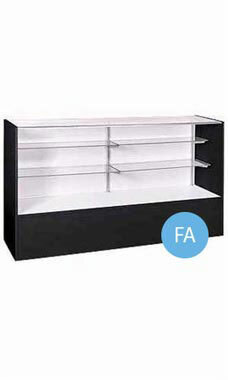 Using our full vision glass front display case, retailers can attractively display their most precious inventory. Featuring a tempered glass front, top and two rows of adjustable 1/4" split glass shelves, these display showcases allow customers to view the items from all angles. With a low pressure melamine laminate black exterior, and white deck and doors, the showcase provides retailers with convenience in restocking and storage. The black cases also feature brushed aluminum hardware with an optional lock and light kit available to complete your retail display unit. Crating for secure shipping included in the price of the case. Overall measurements include: 38"H x 18"D x 70"L. Fully assembled and available for immediate shipment. Very happy with the display case, but it is bigger than expected, which is not a bad thing! will hold lots of merchandise!